It was the great function arranged by Malayala Manorama as a part of their concern 'Ente Malayalam'. Mammootty fulfilled his dream by acting in drama as 'Bheeman' for his great master M.T. Vasudevan Nair. The great E-book about MT 'MT- yude Lokangal' also published on the function. It includes 65000 digital pages of audio books and contents. Mammootty was the man of the evening, yesterday at the Lulu Convention centre Thrissur .The master actor who was portraying an inspired performance on stage based on M.T. Vasudevan Nair's novel, 'Randamoozham, ' charmed audiences with his meticulous display of enacting four characters from the novel. 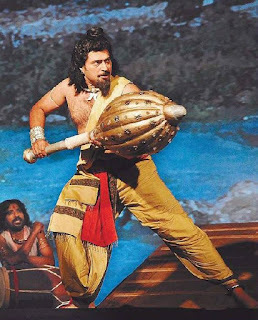 The show titled ''Bhemman'' was organized by Malayala Manorama, where the actor displayed his ease in stage acting too, in the roles of Bheema, Arjuna, Karna and Yudhishtira. Directed by T K Rajeev Kumar and Pramod Payyanoor, the show also had multimedia projections and backdrops with eight screens via four projectors working in tandem. The deep voice and intense performance of Mammooty supported by 13 other actors in lesser roles definitely moved its creator M T vasudevan Nair deeply. The veteran who discovered the star in Mammooty in the seventies, congratulated the actor for his mesmerizing performance and blessed all his future endeavors. Mamootty who saluted MT for infusing meaning to every pregnant silence of Mahabharatha through the master work ''Randaamoozham' ', was more than happy for his mentor's whole hearted blessings. Mammootty later said that the offering was a gurudhakshina for M T , who made him read serious literature in his childhood. He also stated that MT was a writer who wrote very strong characters for his screen performances. Malayala Manorama '' the leading media group in Malayalam, organized the show as a part of their ''Ente Malayalam'' program that has been planned to revive people 's interest in Malayalam literature. The digital version of the complete works of M.T. Vasudevan Nair was also released at the function. The collection of 65,000 digital pages comprising of M.T's novels, short stories, essays and screenplays were released by film directors Kumar Sahni, K.G. George, Satyan Anthicaud, Lohithadas, poet Akkitham, music director Ravi, producer Shobhana Parameshwaran Nair, writers M. Mukundan, N.S. Madhavan, actor KPAC Lalitha and playback singer K.S. Chitra. All of these greats too witnessed the great performances of Mammootty and his crew on stage. mammootty is trying to compete with mohan lal. but his acting in bheema once again proves that he is not at all an enemy for mohan lal.